(CNN) -- The plane that crashed Thursday night near Buffalo, New York, had its nose down and wings tilted to the left just before impact, a witness told CNN on Friday morning. 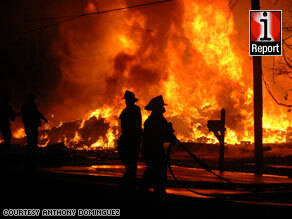 iReporter Anthony Dominguez saw nothing but flames and smoke when he arrived on the scene. "The plane was nose down -- not as steep as is being reported but steep enough that it didn't look right," said Tony Tatro, who lives next to the crash site in Clarence Center. "The left wing was tilted lower than the right, so it was pitched and it was headed down." The crash of Continental Connection Flight 3407 about seven miles shy of Buffalo Niagara International Airport killed all 49 people aboard and one person in a house. The plane, which officials said was on a landing approach, was headed away from the airport but may have been simply making a turn, Tatro said. The plane's engines "didn't sound typical," he said. "I can't say there was engine failure or anything like that, but it didn't sound typical," he said. The steep trajectory of the flight -- though "it wasn't going straight down and it wasn't spinning" -- probably minimized destruction on the ground, Tatro said. "Had it been on a flatter trajectory it would have impacted more than just the one house," he said. "The two homes on either side ... are relatively close to the home that was hit. Had the plane been any flatter it would have hit either or both of those homes." The plane was loud as it came in, as if for a takeoff rather than for a landing, said David Luce, who lives 300 feet from the crash site. "The engines sounded like they were revving at very high speed, an unnatural sound," he said. "... Then the engine cut out -- stopped. And within a couple of seconds, there was this tremendous explosion. A mix of light rain, drizzle and freezing rain was falling in the Buffalo area at the time, Luce said. After the impact, flames reached twice the height of the houses, Luce said. "You wanted to get closer to see if you could help someone, but you didn't dare," said his wife, Mary Jane Luce. Neighbors were running from house to house to check on one another, she said. "There was no approaching the fire." The house the plane struck was "nothing but a pile of rubble" less than two minutes after impact, David Luce said. When local TV stations broke the news of the crash, iReport contributor Nicole Komin said she and some friends hurried to the scene. They could smell smoke and aircraft fuel from miles away, Komin said. "The closer to the actual crash, the harder it was to see anything or breathe," she said. The area was swarming with first responders by the time iReporter Anthony Trigilio arrived in his pajamas and a hoodie. "I saw people pouring out from all sorts of neighborhoods and stuff like that. There were tons of firetrucks, tons of fire sirens, more than I've ever heard in my life. Lots of people all over the place. It was pretty chaotic," Trigilio said. All About Air Disasters • Buffalo (New York) • Continental Airlines Inc.